The hazel fairies lived at the edge of the forest. There, where a small path led along the trees stood a bush with lots of tall hazelnut branches. And those who have learnt to see with the eyes of the heart would discover many small, light beings there: blackberry fairies, elderflower fairies and sometimes even a little cornflower fairy. 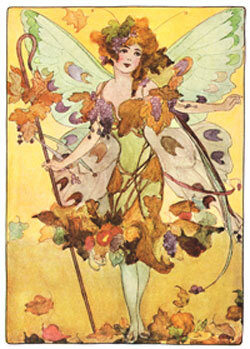 fairies, who was quite wise, with a thoughtful expression on her face. She said, The summer was too hot little fairy. We have no food left. Everything has been eaten up and bad days lie ahead if we do not find some hazelnuts soon. Hazel Fairy knew that although fairies eat very little, they soon become weak and ill if they get no food. So she ran as fast as she could to her neighbour the blackberry fairy. But she had no nuts, only blackberries and was very sorry indeed she couldnt help. 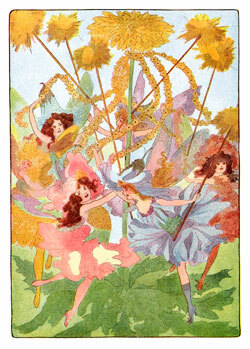 Even the friendly cornflower fairy was sad that hazel fairies could not eat small corns, however finely ground. Well, to live, everyone needs just what is intended for them. Hazel Fairy moved on sadly. Not a single dried nut was to be found. She thought of her little sisters, who by now were probably so weak that they couldnt even fly. 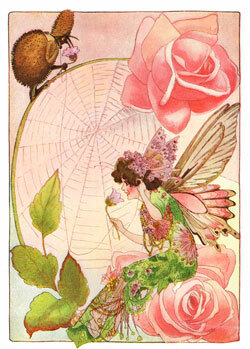 Hazel Fairy sat down in the shadow of an elderflower bush and a small, gleaming tear ran across her cheek. What are you doing? a bright voice behind her asked. Hazel Fairy turned round in fright and then had to laugh when she saw that it was Elf Child. Everyone in the forest knew Elf Child. She was nice to everyone and often had good advice to offer. I dont know where to find nuts and we need some very urgently, she sighed. Then go to the mice or to the hamster! And dont forget: He who loves and gives, will receive, Elf Child encouraged her and disappeared before Hazel Fairy could thank her or ask her about the meaning of the strange saying. So she set off and soon knocked at Mr. Mouses door. I should give you nuts? Mr. Mouse sneered. To you lazy fairies? You play around the whole day while our kind is working away to gather some food! he cried in an unfriendly tone and slammed the door on Hazel Fairys nose. That was not nice, but when it comes to giving, most people tend to offer lame excuses. That left only Mr. Hamster, a grouchy old fellow, who was surely having his winter sleep by now. 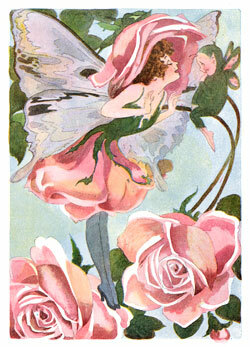 Hazel Fairy was frightened to wake him, but as she had no choice she went to his den and knocked thrice. Nothing moved. She knocked thrice again as loud as she could and heard his shuffling steps come to the door. He opened the door a crack. What do you want? he rasped. Mr. Hamsters ears pricked up. What will you give me for them? he asked cunningly, because he noticed that Hazel Fairy was desperate, and some people like to profit from such situations. Oh no, thought Hazel Fairy, not my hair, my rich, red fairy hair, one half of which she plaited into a braid every morning. How would she look? Everyone would laugh at her and no one would find her pretty any longer. Alright, if it must be, it must be. She took the hamsters scissors and cut and cut. 20 good nuts is what she got. They were heavy for a little fairy, but even worse for her was that she could not find anything to tie over her head to hide her short hair. She hoped she would not meet anyone she knew looking the way she did. She did not even have a mirror to get used to her new appearance. Once it seemed as if Elf Child were winking to her through the trees in encouragement. What would her sisters say? She would not go out to play in the coming days looking like this. Finally she reached the great bush. To her great surprise, no one commented on her appearance. Why was no one horrified at her hair? Everyone only asked her where she had been, and she told them the entire story, leaving out only the part with the hair. 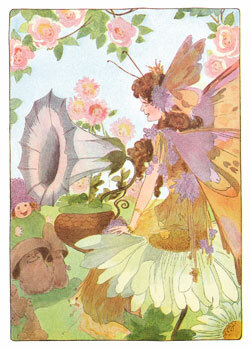 Everyone was happy that Hazel Fairy was back and half a nut was ground immediately to revive themselves. Why ever did you go to the miserly mouse and allow the horrible hamster to abuse you? her fairy sisters asked her. Because I love you all, replied Hazel Fairy and ran to the brook as fast as her legs could carry her. But what a surprise! Her hair was even longer and more beautiful than before and was gleaming in the evening sun. What had Elf Child said? He who loves and gives will receive? Then she noticed that someone was standing at the bend in the stream.